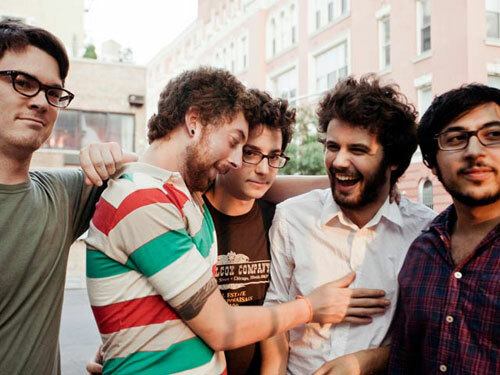 Passion Pit’s first LP Manners exploded onto the east coast music scene in 2009. The Kidz Bop electro-twee of Manners is sweet enough to rot teeth at times, but several of the tracks are mercilessly catchy and were played on repeat in my apartment. Passion Pit’s sophomore record Gossamer is due to be released this July but unfortunately, the debut single ‘Take A Walk’ will have fans of Manners and the earlier Chunk of Change EP wanting to do the same. Then there is the matter of the lyrics. Apparently sometime in between Manners and the upcoming Gossamer, Michael Angelakos decided that Passion Pit could take a more mature, “honest” approach to songwriting. ‘Take A Walk’ could have easily captured the tongue-in-cheek pop sincerity of something like the Desaparecidos’ ‘Man And Wife, The Former.’ Instead, the song falls in between silly and embarrassing with its serious yet adolescent document of the struggles of two men during America’s two worst recessions: The Great Depression and Since I Graduated College to Date. One guy sells flowers outside of Penn Station in order to save up enough money to get his wife and family across the Atlantic only to have them bail on him shortly after their arrival. The other over-borrows and makes crappy investments that go bust landing him in a cowardly state of poverty. Both men take walks. Actually, over fifty walks in four minutes thanks to the obnoxious refrain. Angelakos’ once manic and appropriately boyish approach to youthful relationships now feels like a teenager lamenting melodically over a Wall Street Journal headline that he finds on his father’s pillow. Plus, a lyric sheet would have been appreciated, even if it were just for clarification: “Honey, it’s your son, I think I borrowed just too much. / We had taxes, we had bills, we had a lifestyle that was fun. / And tonight I swear I’ll come home and we’ll make love like we’re young …” Woah, woah, woah, did he say “it’s this loan” or “it’s your son”? I did get the opportunity of seeing Passion Pit live a few weeks ago and I can tell you that the lackluster ‘Take A Walk’ isn’t necessarily indicative of the rest of Gossamer. Some of the new songs were different in a stirring way, almost as if Angelakos had worked with James Blake whom he has cited before as an influence. ‘Take A Walk’ may not be the poppy jaunt that one would have expected as a follow up to Manners, but it shouldn’t cause anyone to run away.